Albers home nestled into the hillside, and surrounded by the gardens. In the island bed named Serenity, a large Chinese lantern sits between and behind two Japanese maples – Acer palmatum ‘Inaba Shidare’ on the left, and Acer palmatum ‘Viridis’ on the right. 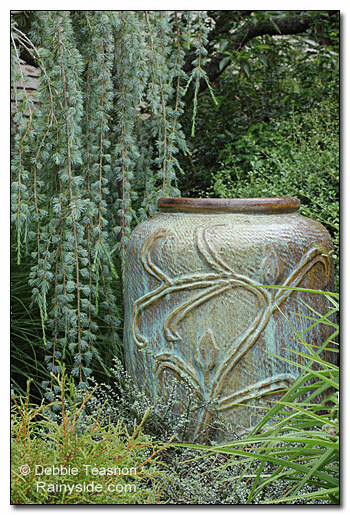 Layers upon textural layers abound in the garden. 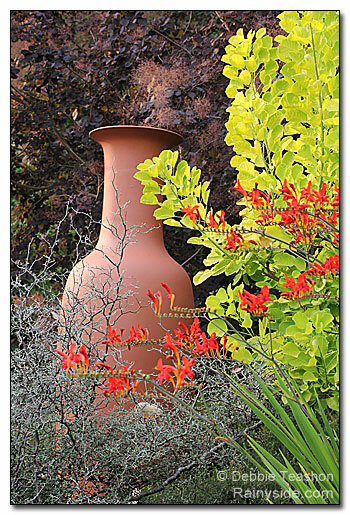 The large vase next to the golden smoke bush (Cotinus ‘Golden Spirit’) beckons you to come closer and is a favored spot for hummingbirds when the Crocosmia ‘Lucifer’ is in bloom. 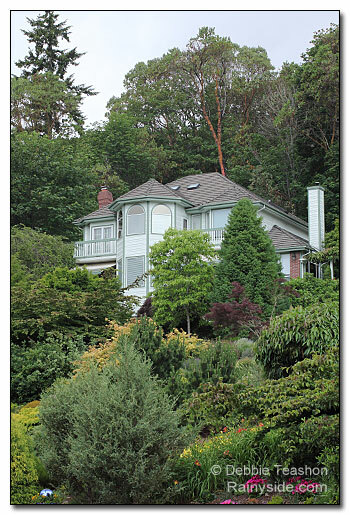 Nestled into a southwest-facing slope overlooking Port Washington Narrows and Phinney Bay in East Bremerton is a four-acre garden paradise. 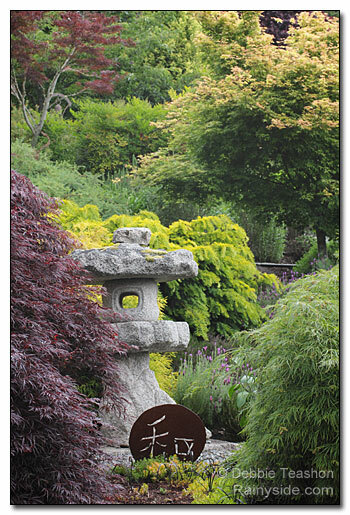 It is a destination for many garden lovers. But the garden wasn’t always like this. From humble beginnings, it was transformed with the hard work of its dedicated homeowners — John and Santica Albers. In 1998, the couple fell in love with the home surrounded by two acres. Back then, the garden contained an acre of lawn, and an orchard, while blackberries and other invasive plant species overran most of the property. When they bought more land surrounding the property, the garden grew to four acres. In 1999, Albers took on the task of identifying the plant species living in the half-acre woodland he named Madrona Woods. He found that nearly all the species there were native to the Pacific Northwest. One of the madronas (Arbutus menziesii) growing there is estimated to be more than a century old. The couple recently purchased another chunk of land bordering their garden. John would not divulge if they bought the last property to save the tallest sentinel on the hillside — a large Sequoia tree. However, there was a twinkle in John’s eye as he spoke about the conifer, and the development of a new garden room they call the Redwood Sanctuary. Over the years, Albers collected many specimens of plants. The property evolved into fourteen separate rooms with goals set for each area. Every garden room has a unique theme, and plant palette. In the lower part of the property, John planted dawn redwood trees (Metsequoia glyptostroboides). 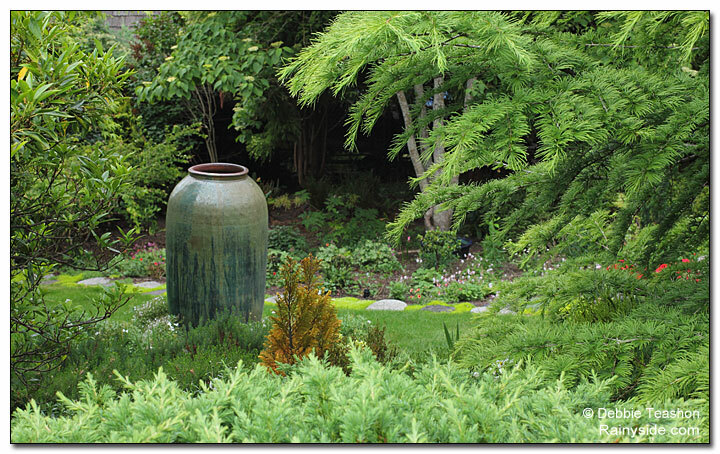 Although he hadn’t originally planned to have a woodland garden there, circumstances in life gave the couple a reason to plant more trees and create a shady garden. The change came about when rather than letting a beloved collection of rhododendrons deteriorate, John Lentz — an aging relative of the Albers as well as a good friend — asked Albers if he could find good homes for them. Albers agreed to take them, and so The Lentz Garden came to be. Today Japanese maples, striped bark maples, Cryptomeria, and dawn redwoods turn this garden into a wonderland of shifting shadows, and textures. 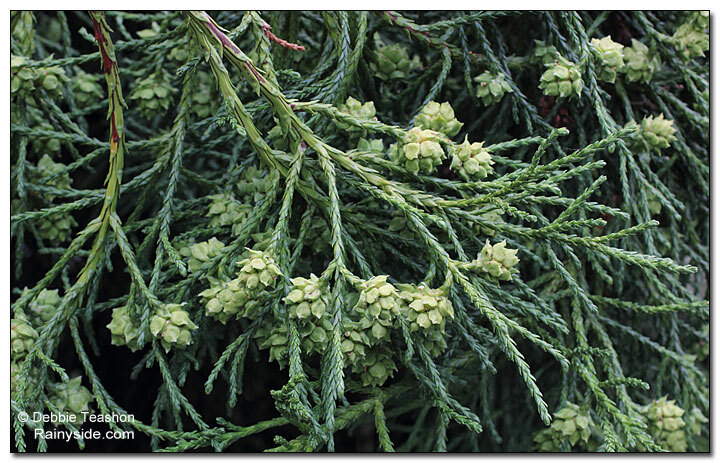 Lentz’s collection now rubs elbows with native plants as well as shrubs in the same Ericaceae family as the rhododendron. Lentz lived long enough to see his rhododendrons (some of which were over 35 years old) flourishing in their new environment. Stepping out of the woodland you come to an open garden room they named Betty Albers Memorial Garden in memory of Albers' mother. The only space on the property with a lawn, yet is not a typical one. Albers planted tough, drought tolerant orchard grass – a mix of fescue, perennial rye, and clover to fix nitrogen into the soil. Albers explained why clover grows with the grass. “We don’t fertilize the lawn, and it requires a minimal amount of water.” Even in a year of extreme drought, the tough lawn is staying mostly green. “We have a few brown spots this year. It’s doing pretty well, but we don’t worry about it because it always comes back," Albers said with a laugh. Small flowering plants also grow in the lawn, planted for the pollinators. Albers planted roses, small rhododendrons, and unusual flowering trees and shrubs in the beds, because his mother always grew flowers in her garden. With an addition of a bench, the garden became a quiet sitting place for contemplation. Growing a sustainable garden is important to the Alberses. They minimize supplemental watering to a few beds; however, the rest of the garden has to weather the local climate conditions. The couple keeps new plants well-watered until established. Albers is optimistic about this year’s drought. With the added yearly compost mulch, and a soil rich in soil microbes, the plants thrive and grow through extended drought periods. “Without that, most of the plants would die,” he explained. “Many people don’t know that fact about mycorrhizae, or even know what it is. Albers' passion for the garden, shows. He considers himself a plant collector – he grows over 150 conifers, many of them dwarf. He considers the garden paradise for Santica and himself, also for visitors to the garden. 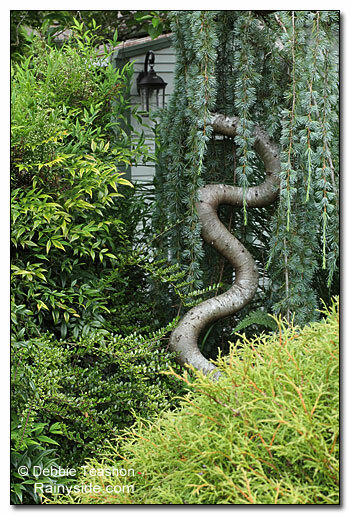 It is not surprising to hear him say, “The garden is a big part of our lives,” when you see the extensive plantings, and the expansive gardens on the slope surrounding their home. Besides maintaining the four acres, Albers works full time as a University of Washington professor. Yet he found time to set up a foundation and make the garden a nonprofit entity. 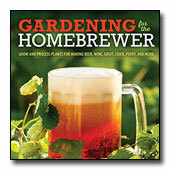 He also found time to write an impressive book about the garden — Gardening for Sustainability. He currently is writing another book. Santica also has a hand in the garden. “For me, the garden is an extension of the home,” she said. She played a major role in designing the transition from the woodland to the Stroll Gallery and came up with the idea of creating a 9/11 garden in memory of those who lost their lives on that fateful day. Santica enjoys collecting art for the garden. When an art piece speaks to her, she buys it and brings it home. 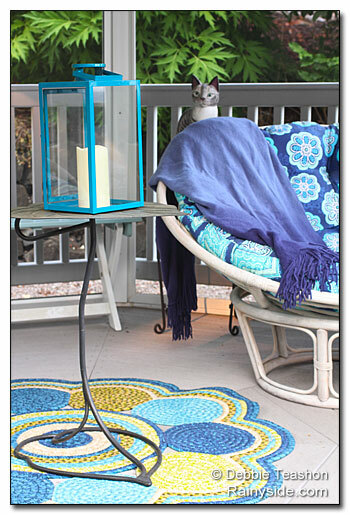 Then she finds the perfect position for the art as a focal point, or a complementary or contrasting accent. 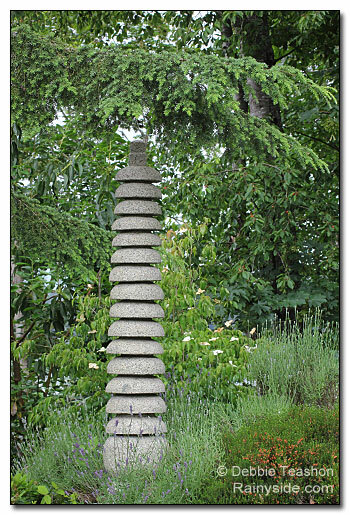 She is not above placing a humorous piece in the garden, yet manages to find the right place for them. 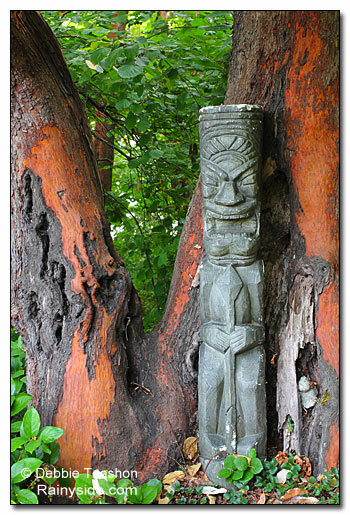 A great example is the Big Foot sculpture placed in the shadow of a large native madrona. One of her favorite places in the garden aptly named Santica’s Perfect Solitude, is nearly at the top of the slope. A gazebo stands there with views of Mt. 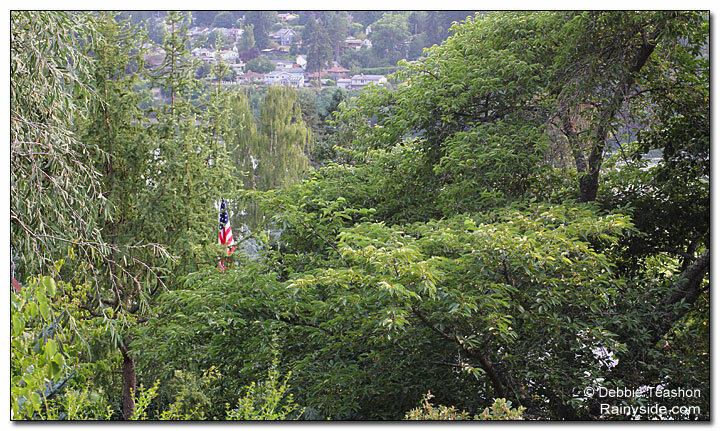 Rainier to the southwest, and the tree canopy of the garden and sweeping vistas of the water below to the west. The garden surrounding the gazebo is a rose garden. Her other favorite garden is the Lentz Garden. A small section of the Memory Garden and the only place where lawn is planted. 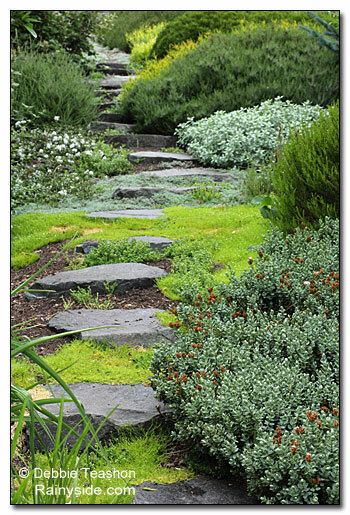 Stone path to garden above. 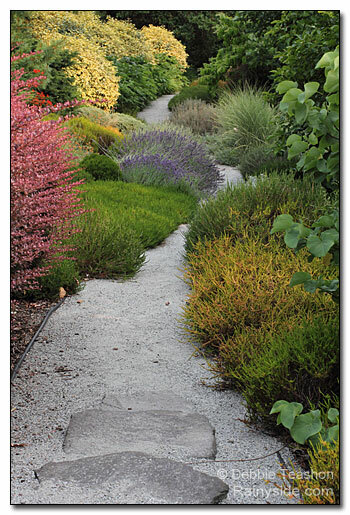 Layers of plant textures and shapes line a path in the Stroll Garden. High on the hillside, you peer through a canopy of trees to the flag that presides over the 9/11 garden. 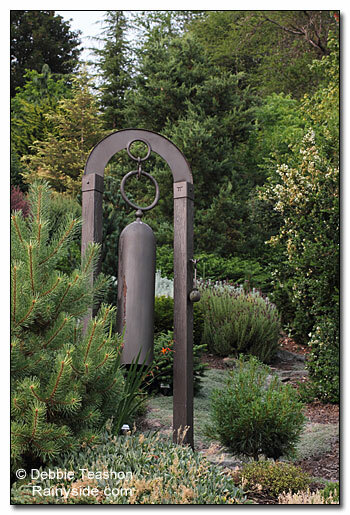 Metal sculpture placed artfully in the conifer garden. Stone sculpture on the edge of driveway. 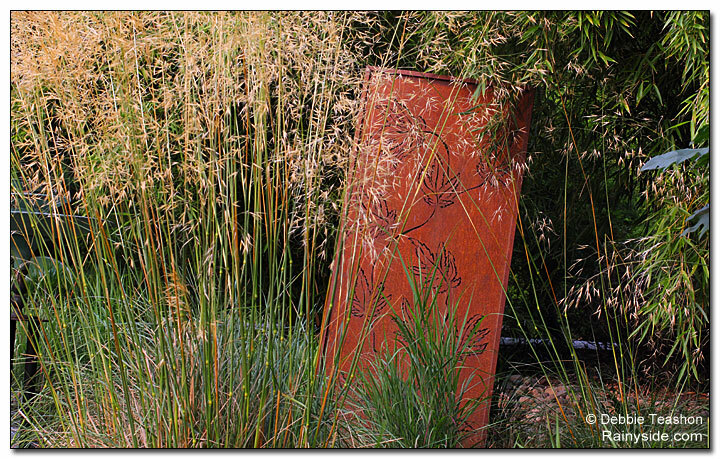 Metal sculpture enhances the sea of grass in front of it. 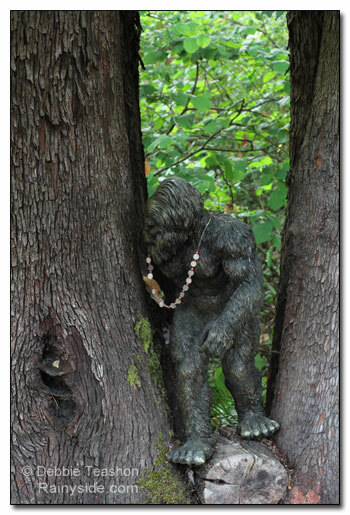 Big Foot provides a bit of humor to the garden. One of the many mature native madronas that grows in the Woodland Garden. 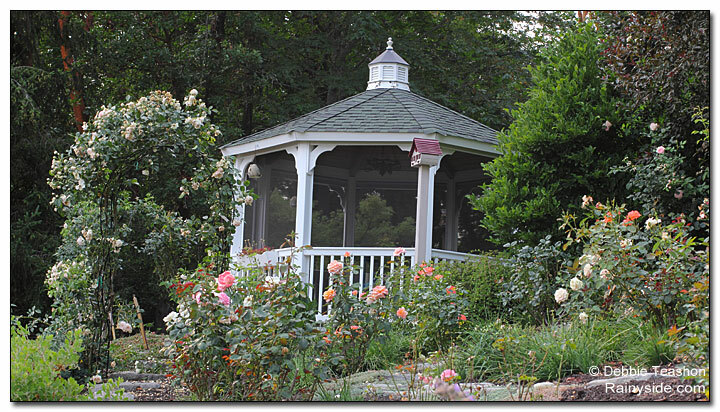 Santica’s Perfect Solitude garden features a gazebo in a rose garden. 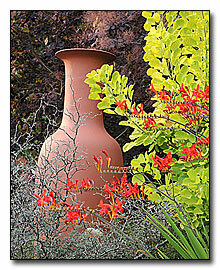 Pottery in the garden, provides focal points and enhances the plantings around them. Yellow-twig athrotaxis (Athrotaxis x laxifolia) endemic to Tasmania, is one of the many unusual conifers in the garden. John and Santica Albers in the garden. Albers Vista Garden is available for group tours by appointment. Individuals can tour the garden on open days throughout the growing season. The Albers Vista Garden is a nonprofit foundation. John’s goal is to preserve the botanical oasis, and protect the flora and fauna that are part of the garden for perpetuity. A new building is currently under construction that will become a learning center to help inspire environmental stewardship and promote sustainable landscape practices. 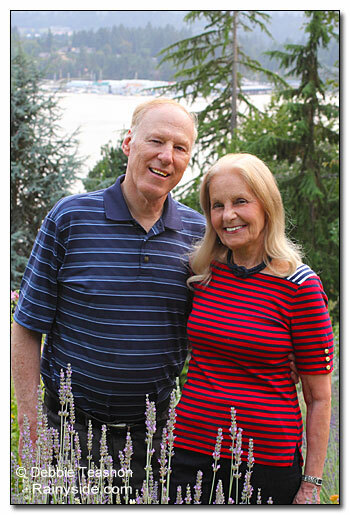 Visit albersvistagardens.org to find information about John’s books, the gardens, open days, tours, or volunteering as a docent. Article originally written for the September/October 2015 issue of West Sound Home and Garden magazine.